With Restaurant Makeover (one of our villains for 2007), restaurant owners literally put their livelihood into the hands of strangers, who match them dollar for dollar on a giant overhaul, hoping that they can help to improve whatever it is that isn’t working. In some cases it’s the food, sometimes the décor, or often a combo of both. The crack team of specialists swoops in and works its magic on what is almost always portrayed as a pitiful shell of a business to make it thrive. 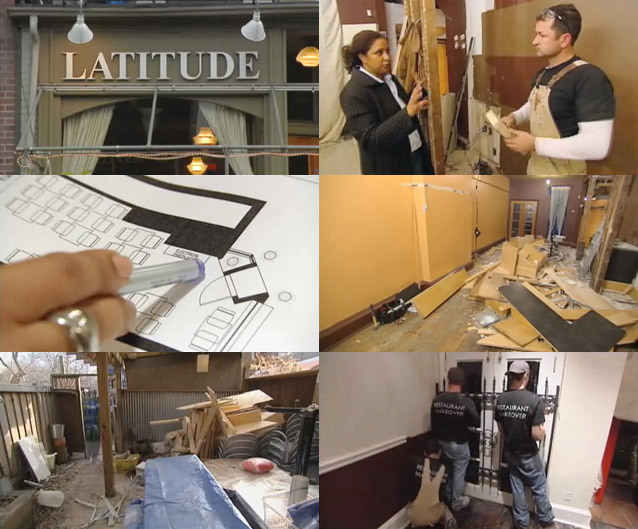 What these business owners—and most viewers—seem not to fully realize, however, is that Restaurant Makeover is 100% pure television, from its minute-by-minute formula to its faux meltdowns complete with dramatic hair-pulling and bleeped expletives. The show wrapped taping for good at the end of 2008 (according to a source, they feel they now have enough shows in the can to repeat them “ad nauseum” and continue to make a profit), but it continues to rile television viewers and commenters all over the web. Many restaurants have gone under immediately following their makeovers. So why do owners do it? What do they get out of it? What does Restaurant Makeover really want to get out of them? And is it all as bad as it seems? Latitude Wine Bar and Grill. The promotional value of being featured in an episode is dubious at best. As an hour-long commercial for a business, it’s not necessarily a great asset: in order to syndicate worldwide, almost every identifying detail that would tell someone how to go and eat there is left out. If you’re not from Toronto and already clued into reading the backgrounds to look for landmarks, you’d still need to go to Google to find the places featured on the show, and every barrier between a customer’s appetite and a restaurant ain’t good. As a $30,000 reno, it often falls completely flat because, again, they’re not trying to save a business—they’re trying to tape something that people will watch, which they clearly have succeeded in doing (seeing as how the show is syndicated all over the world). The designers do consult with the business owners. Briefly. But a consultation is not a collaboration. The owners are not presenting an overall concept, and they are not involved at all beyond the initial chat. So, although the designers are ideally trying to create something the owners will love, they are really going for what the cameras will love. Combine that with a tight timeframe, and you’ve basically got a formula for churning out sets—something slapdash and flimsy is fine, since it doesn’t have to last for the show’s purposes; and hey, solid wood and particle board both look the same on film. A source who has worked on more than forty episodes of the show states that some designers are more sensitive to the owners’ vision than others: most owners come away happy with the designs of Glen Peloso, Cheryl Torrenueva, and Cherie Nicole Stinson, he says, but Meredith Heron has her own style and rarely deviates from that—no matter what the owners actually want. 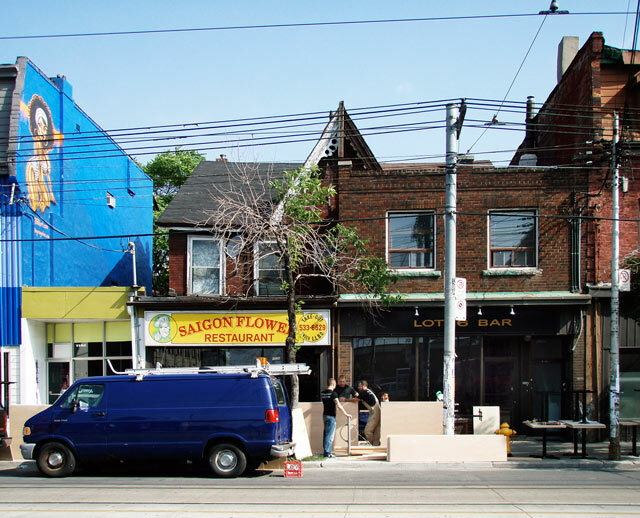 One owner, who does not want her name or her business’ name revealed (note that none of the owners of the restaurants pictured in this article were necessarily interviewed, on or off the record, by Torontoist), was deeply disappointed with Heron’s transformation of her space. “She didn’t take [my cultural background] into consideration at all,” she says. “I wanted to finally feel like this restaurant was my space, and she didn’t listen to any of my suggestions. I told her that I wanted a vibrant colour like burnt orange to match my personality, and she didn’t listen to that. I told her that I wanted to turn the place into more of a bar—in fact, I don’t think anyone even knows that we have a liquor license—and she completely ignored me. The only thing she did pay attention to is that I do like green, and I think that stuck with her because I complimented the green jacket she was wearing when she came in (for the consultation) beforehand.” This business owner had wanted to renovate her restaurant, which she co-owns with her husband, for a long time, but was quoted $80,000 for the job. A customer who is an artist with contacts on the show, who wanted to help, recommended doing Restaurant Makeover as a way to get the renovations done. She had never seen the show and hadn’t talked to any other restaurant owners who’d done the show beforehand—something that seems surprisingly common among owners who choose to do it. She figured that the show would be making money from syndication, and in return was going to give her a nice place. What she actually received was wallpaper and cheap vinyl flooring (both of which had started peeling by the next week), banquettes and tables with nails sticking out of them that ripped customers’ clothing, and chairs that “imploded” when people (including an 80-year-old man) sat on them. Some of the structural changes also violated building codes. “Igor was back in on [the long weekend] on his own time to help fix the banquettes,” she said, adding that he personally apologized for the bad work, and he even refused in a future episode to use some of the same supplies after the “mess” he’d made with them at this restaurant. Feeling completely ripped off, she called the producers, asking to see receipts for what the money had actually been spent on and to have the faulty chairs replaced. She was told to get a lawyer. Sandy Moon, owner of Grapefruit Moon in the Annex, seems to be the most infamous of all of the Restaurant Makeover owners. “They keep airing my episode because it’s such a ‘shocker,'” she says. “I feel like it will never go away.” She was approached to do one of the first shows taped in the first season. She was promised that not only would they match her money, but that sponsors would help stretch those dollars and get her better value than anything she could pull off without them. The reality of the experience, however, didn’t match the promises. Thinking back, she says that “if it had been my bathroom, no problem, but this is my life. I have kids and a restaurant and nothing else.” Designer Meredith Heron asked her likes and dislikes and was given a small set of parameters—she was asked not to use orange (“I didn’t want my place to look like Harvey’s; that colour is really ‘fast-food’”), and she was asked not to paint over the beautiful exposed brick wall. Moon was promised that she would be receiving an “ergonomic” space that would be easier and more efficient to use. She was also asked not to clean before the crew arrived (“It was supposed to be good for the drama of the episode”), and production began. A week later, Moon was appalled not only to find orange and other citrus-coloured crap strewn about (“She was trying to pick up on the ‘grapefruit’ thing—I guess she hasn’t heard the Tom Waits song”) and her brick wall painted white, but also to find that she was left with the same appliances she already had and without any storage space for plates & dishes in the kitchen. Heron had replaced her chairs with beautiful dining room chairs that were much too large: when people sat in them, they left no room for the wait staff to walk past. Moon insisted that the crew return to restore the functionality of her kitchen, and they did, but it took almost three days to get everything up and running again. But even worse than the hack job on the space, according to Moon, was what happened after. The show is frequently accused of staging action, which is very often true. Sometimes the events staged are little—the Bagel World episode, for example, features a clip of a “customer” who is actually a crew member’s wife—and sometimes they’re a little larger. The Casa Mendoza episode featured a “chef” who is actually the owner’s partner and who does not work in the kitchen at all (which explains her klutzy, uncoordinated attempts at throwing food together). According to a source, the actual chef was a “huge Polish lady with a heavy accent and a lazy eye.” The crew, however, was totally fine with it—it was the decision of the owner to change who appeared on camera. Unlike other reality makeover shows (think What Not To Wear or Kitchen Nightmares), Restaurant Makeover is not about working with what you have. It’s about a complete transformation. So design features that create a certain atmosphere—like the funky, approachable feel of pre-Makeover Le Café Vert or the eclectic vibe of pre-Makeover Grapefruit Moon—can be completely demolished with very little thought given to the rationale behind it, as “new” is the only important factor. The menu changes imposed by the superstar chefs are often axed because they are way too labour-intensive (like the molten chocolate cake in the Bon Vivant episode) or because they are not what the clientele is asking for (like the fancy seafood dishes introduced at the Boathouse, which has reverted to its chicken-fingers-and-fries menu post-Makeover). So can Restaurant Makeover truly be charged with the failure of any of the restaurants it’s featured? Well, first look at the list of restaurants that have failed since their makeovers. Amazingly, most of the restaurants from season one—which was taped in 2004—are still in business. Only three of those fourteen are no longer around. From season two, seven out of twelve are still operating; season three, eighteen out of twenty six; and season four, twenty-four out of twenty-six. Those numbers don’t appear to be far off from the average—available statistics suggest that between 60 and 80% of restaurants in large cities fail in their first three years. And, of course, restaurant owners who approach Restaurant Makeover are likely already struggling or in need of work in some way, which makes them already vulnerable. One difference between restaurants that fail on their own and those that fail after Restaurant Makeover, however, may be largely emotional. The over-the-top attacks and criticism thrown around by the designers, chefs, and crew can feel very personal. Sandy Moon suggests, “It’s very disheartening. People don’t realize it’s your livelihood; they just feel so free to attack and mock something that is meaningful to you. It makes your effort, your choices, feel like a waste. It totally changes the place.” For other restaurant owners, the disappointment with the work can be gutting. The owner of the restaurant with the imploding chairs mentioned earlier says it’s extremely difficult to come in and spend eighteen hours every day in a place that she no longer feels positive connections to. “Every time I’m in here, I just look and keep seeing all the mistakes, all the things that irritate me about what happened. They’re there all the time, they never go away…It was a bad experience that I have to be reminded of every single day.” She has even said that if her feelings don’t change over the next few months, she is seriously considering folding up shop and moving back to her home country. “We have no more money to invest into changing anything now—we spent everything, including an extra $2500 to replace their chairs. There’s nothing left to undo this. So we have to look at it all the time. I feel like I haven’t been myself since the experience, and it’s terrible. I don’t know what else to do.” And other restaurants obviously fail when after their makeovers, they no longer feel like “home” to the regulars, who find other, more comfortable digs elsewhere. Not everyone despises the changes. A source confirms that the joyous reactions of some of the owners, like those of Peridot and Earth Indian Restaurant for example, were sincere, and that their makeovers have been positive experiences overall. One success story that falls completely outside of Makeover’s formula (think of it as a kind of Restaurant-Makeover-Meets-Ty-Pennington tale) is the story of the Full Circle Café. The space acts as a community kitchen and dining area for residents of a “multifaith affordable housing” building in the Davenport and Avenue Road area. Never intended to be a viable commercial space, the café is a resource for residents and community groups to use. “In our opinion,” says a source, “Restaurant Makeover was a huge success.” The fund-matching gave the building the opportunity to redevelop their space, which they wouldn’t have had the money or technical skill to do themselves. Though it’s no longer named the Full Circle Café, the space still functions, and the building is looking into using it for other partnership initiatives with organizations such as Common Ground, which helps people with intellectual disabilities to work in catering. Too bad the show hasn’t worked with more spaces like this one; it would be a great way to potentially put lots of resources to good use. But it would be a lot harder for the designers and chefs to spit out bitchy bon mots, and “tame and supportive” might not play well in Vancouver or New York. And in the end, that’s really what the show is all about, isn’t it?